A rustic, country style, solid pine Arts and Crafts front door. The door has an attractive design, typical of the era, with moulded detailing, forming a panel style appearance. The door has a diamond shaped panel glazed with original bullseye glass. The door has been stripped to bare wood and has been well made with mortise and tenon joints. The door has a thick weather strip at the base of the front face. The wood has a riven texture to the grain and has a pale colour. The door is ready for finishing by purchaser, with oil, paint or varnish. The letter box space is quite small, we can increase the size to accommodate a larger letter box for an EXTRA CHARGE. Please contact us for a quote and to discuss your requirements. The door is antique and rustic and therefore has some signs of use and wear. The wood has a riven texture and there are some stains and marks. There is some damage to the hinge areas where the hinges have been removed. This damage can be patch repaired for an EXTRA CHARGE, please contact us for further information and a quote. Some small holes, marks and knocks can be seen, especially to the edges. 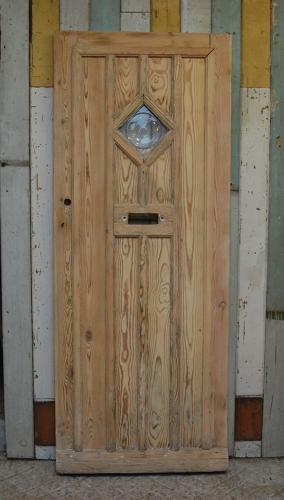 The door is full of character, with rustic charm and is perfect for a cottage or country property.